Hygenex Prime compliments weekly hygiene services with a monthly deep cleaning of floors, walls, and vents. 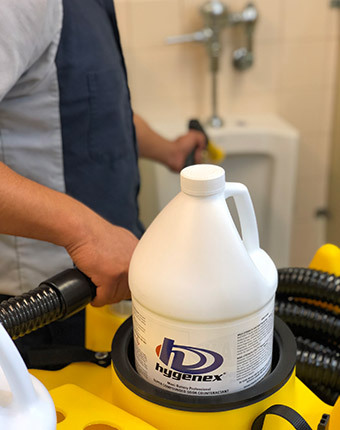 Unlike traditional mopping where a dirty, germ infested mop goes back into the dirty water before spreading it around the restroom floors, with Hygenex Prime, we will power wash your restroom floors, grout, baseboards, etc. This removes a lot of the grit, grime, and germs that mopping alone cannot. Then we allow the cleaning agents time to do their work before scrubbing all surfaces with our proprietary cleaning tools. We hit floors, baseboards, walls, partitions, we even blow out dusty overhead vents. Finally, we vacuum the soiled water back into the machine and remove it from the facility. Your customers and employees will feel safe and satisfied with your restroom environment! Every surface of your restroom is power washed… floors, walls, partitions, vents, corners, and every other hard to reach surface! Odor-causing bacteria is removed using a high power vacuum leaving the restrooms smelling even fresher! Soils and germs that conventional cleaning just spread around and leave behind are actually removed from the facility.